Turkey's ties with Russia are too strong to be broken by France's president, Foreign Minister Mevlüt Çavuşoğlu said Monday, after Emmanuel Macron said Ankara's support of missile strikes on Syria showed it had "separated" from Russia. 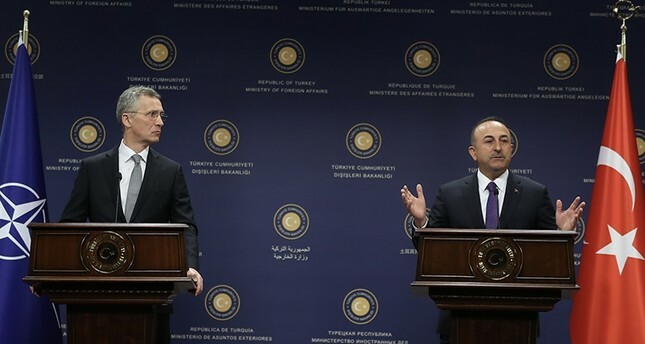 At a joint news conference with NATO Secretary-General Jens Stoltenberg in Ankara, Çavuşoğlu added that Turkey's relations with Russia were not an alternative to its ties with NATO, France and the United States. "We can think differently but they (our relations with Russia) are not so weak that the French president can break them," Çavuşoğlu said. President Vladimir Putin's spokesman Dmitry Peskov also dismissed Macron's claims that the weekend air strikes had driven a wedge between Ankara and Moscow. "No, these strikes did not split us. It's no secret that positions of Moscow and Ankara differ on a number of issues. At the same time, this does not prevent us from continuing to exchange views, to continue discussing this difference in positions," Peskov said. "And most importantly, in no way does this affect the future prospects of the multidimensional development of our cooperation and interaction in the implementation of major economic and other projects that Moscow and Ankara have set for themselves." There have been growing signs of Western discomfort over the alliance of Turkey -- a key NATO member since 1952 -- with Iran and Russia over Syria. In an interview with French television, Macron suggested that the air strikes against Syria regime targets over the weekend had succeeded in engineering a split in the Russia-Turkey alliance. "With these strikes and this intervention, we separated the Russians and the Turks on this issue... the Turks condemned the chemical strike and supported the operation that we conducted," the French president told BFM TV in an interview. Russia and Iran are the key allies of Syria's Bashar al-Assad and their military intervention in Syria is widely seen as helping his regime stay in power. President Recep Tayyip Erdoğan on Saturday had welcomed the strikes, which he described as "appropriate" and strongly condemned the alleged chemical attack. But Çavuşoğlu said Macron was mistaken in his assessment and said that Ankara "expected statements befitting of a president" and should express himself "more seriously." Çavuşoğlu said that Macron had expressed interest in attending the Ankara summit and Erdoğan then sounded out Moscow and Tehran over the idea. But while Russian President Vladimir Putin was not against him coming, Iran preferred to meet with just the three presidents and leave a broader summit for later, he said.